On Tuesday we had the opportunity to visit the new Provo City Center Temple as a family. I believe this is the first time the kids have been able to go inside the temple. At least while they were old enough to understand and remember it. As temple goes, the finishes are a little different than most temples I've been to. There exterior, which is the only thing remaining from the original Provo Tabernacle is red brick instead of white and the interior, crafted out of wood is in keeping with the original tabernacle design. 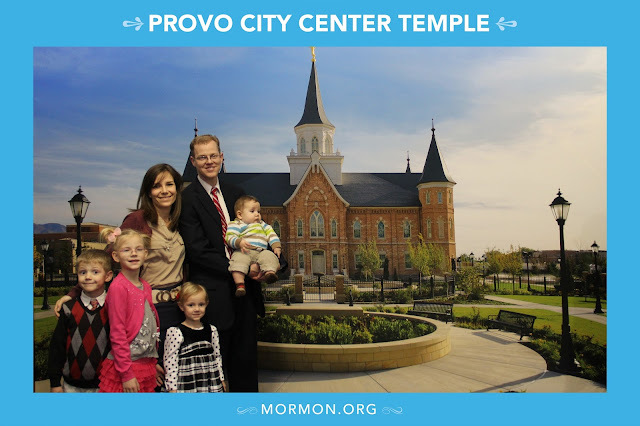 After visiting the temple with the kids I asked Carson and Emilia how did the temple compare with their expectations. Their answers referred to the temple as a building and not as a place of learning and covenant making. Carson was impressed by the twelve oxen that sustain the baptismal font. Emilia really liked the stain glass image of Jesus Christ carrying a lamb displayed by the front entrance to the temple. Carson also noticed that none of the windows were plain glass like at our house. They all had pictures on it. Emilia was impressed by the talent of the people who painted the nature murals in the instruction rooms. Both kids commented on how many, and how steep the stairs were. Stella referred to the chandelier in the celestial room as a birthday cake. "Dad, look at that big cake!" Her own birthday must still be fresh in her mind. Emilia really liked to see the sealing rooms and told us that this is where she'll marry one day. It was a great experience to share with the kids. We are so fortunate to have so many temples nearby. Our own temple the Utah Jordan River Temple just closed this week for extensive renovations. It will be closed for 18-24 months. I can't wait for that open house. It will be that much more meaningful being that it is the one we attend.